The microscopic process of evaporation and condensation at the liquid surface. Vapor pressure (or vapour pressure in British spelling) or equilibrium vapor pressure is defined as the pressure exerted by a vapor in thermodynamic equilibrium with its condensed phases (solid or liquid) at a given temperature in a closed system. The equilibrium vapor pressure is an indication of a liquid's evaporation rate. It relates to the tendency of particles to escape from the liquid (or a solid). A substance with a high vapor pressure at normal temperatures is often referred to as volatile. The pressure exhibited by vapor present above a liquid surface is known as vapor pressure. As the temperature of a liquid increases, the kinetic energy of its molecules also increases. As the kinetic energy of the molecules increases, the number of molecules transitioning into a vapor also increases, thereby increasing the vapor pressure. 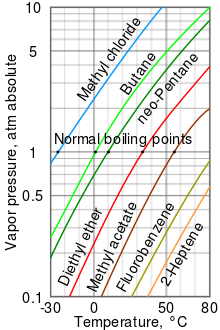 The vapor pressure of any substance increases non-linearly with temperature according to the Clausius–Clapeyron relation. The atmospheric pressure boiling point of a liquid (also known as the normal boiling point) is the temperature at which the vapor pressure equals the ambient atmospheric pressure. With any incremental increase in that temperature, the vapor pressure becomes sufficient to overcome atmospheric pressure and lift the liquid to form vapor bubbles inside the bulk of the substance. Bubble formation deeper in the liquid requires a higher temperature due to the higher fluid pressure, because fluid pressure increases above the atmospheric pressure as the depth increases. More important at shallow depths is the higher temperature required to start bubble formation. The surface tension of the bubble wall leads to an overpressure in the very small, initial bubbles. Thus, thermometer calibration should not rely on the temperature in boiling water. The vapor pressure that a single component in a mixture contributes to the total pressure in the system is called partial pressure. For example, air at sea level, and saturated with water vapor at 20 °C, has partial pressures of about 2.3 kPa of water, 78 kPa of nitrogen, 21 kPa of oxygen and 0.9 kPa of argon, totaling 102.2 kPa, making the basis for standard atmospheric pressure. Vapor pressure is measured in the standard units of pressure. The International System of Units (SI) recognizes pressure as a derived unit with the dimension of force per area and designates the pascal (Pa) as its standard unit. One pascal is one newton per square meter (N·m−2 or kg·m−1·s−2). Experimental measurement of vapor pressure is a simple procedure for common pressures between 1 and 200 kPa. Most accurate results are obtained near the boiling point of substances and large errors result for measurements smaller than 1kPa. Procedures often consist of purifying the test substance, isolating it in a container, evacuating any foreign gas, then measuring the equilibrium pressure of the gaseous phase of the substance in the container at different temperatures. Better accuracy is achieved when care is taken to ensure that the entire substance and its vapor are at the prescribed temperature. This is often done, as with the use of an isoteniscope, by submerging the containment area in a liquid bath. Very low vapor pressures of solids can be measured using the Knudsen effusion cell method. In a medical context, vapor pressure is sometimes expressed in other units, specifically millimeters of mercury (mmHg). This is important for volatile anesthetics, most of which are liquids at body temperature, but with a relatively high vapor pressure. Anesthetics with a higher vapor pressure at body temperature will be excreted more quickly, as they are exhaled from the lungs. Sublimations and vaporizations of the same substance have separate sets of Antoine coefficients, as do components in mixtures. Each parameter set for a specific compound is only applicable over a specified temperature range. Generally, temperature ranges are chosen to maintain the equation's accuracy of a few up to 8–10 percent. For many volatile substances, several different sets of parameters are available and used for different temperature ranges. The Antoine equation has poor accuracy with any single parameter set when used from a compound's melting point to its critical temperature. Accuracy is also usually poor when vapor pressure is under 10 Torr because of the limitations of the apparatus used to establish the Antoine parameter values. The Wagner equation gives "one of the best" fits to experimental data but is quite complex. It expresses reduced vapor pressure as a function of reduced temperature. As a general trend, vapor pressures of liquids at ambient temperatures increase with decreasing boiling points. This is illustrated in the vapor pressure chart (see right) that shows graphs of the vapor pressures versus temperatures for a variety of liquids. At the normal boiling point of a liquid, the vapor pressure is equal to the standard atmospheric pressure defined as 1 atmosphere (760 Torr or 101.325 kPa or 14.69595 PSI). Although the relation between vapor pressure and temperature is non-linear, the chart uses a logarithmic vertical axis to produce slightly curved lines, so one chart can graph many liquids. A nearly straight line is obtained when the logarithm of the vapor pressure is plotted against 1/(T+230) where T is the temperature in degrees Celsius. The vapor pressure of a liquid at its boiling point equals the pressure of its surrounding environment.
. Raoult's law is applicable only to non-electrolytes (uncharged species); it is most appropriate for non-polar molecules with only weak intermolecular attractions (such as London forces). Systems that have vapor pressures higher than indicated by the above formula are said to have positive deviations. Such a deviation suggests weaker intermolecular attraction than in the pure components, so that the molecules can be thought of as being "held in" the liquid phase less strongly than in the pure liquid. An example is the azeotrope of approximately 95% ethanol and water. Because the azeotrope's vapor pressure is higher than predicted by Raoult's law, it boils at a temperature below that of either pure component. There are also systems with negative deviations that have vapor pressures that are lower than expected. Such a deviation is evidence for stronger intermolecular attraction between the constituents of the mixture than exists in the pure components. Thus, the molecules are "held in" the liquid more strongly when a second molecule is present. An example is a mixture of trichloromethane (chloroform) and 2-propanone (acetone), which boils above the boiling point of either pure component. The negative and positive deviations can be used to determine thermodynamic activity coefficients of the components of mixtures. 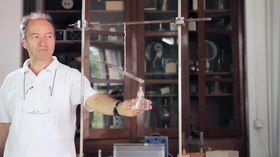 Equilibrium vapor pressure can be defined as the pressure reached when a condensed phase is in equilibrium with its own vapor. In the case of an equilibrium solid, such as a crystal, this can be defined as the pressure when the rate of sublimation of a solid matches the rate of deposition of its vapor phase. For most solids this pressure is very low, but some notable exceptions are naphthalene, dry ice (the vapor pressure of dry ice is 5.73 MPa (831 psi, 56.5 atm) at 20 °C, which causes most sealed containers to rupture), and ice. All solid materials have a vapor pressure. However, due to their often extremely low values, measurement can be rather difficult. Typical techniques include the use of thermogravimetry and gas transpiration. is the heat of fusion. is the melting point temperature. This method assumes that the heat of fusion is temperature-independent, ignores additional transition temperatures between different solid phases, and it gives a fair estimation for temperatures not too far from the melting point. It also shows that the sublimation pressure is lower than the extrapolated liquid vapor pressure (ΔfusH > 0) and the difference grows with increased distance from the melting point. Dühring's rule states that a linear relationship exists between the temperatures at which two solutions exert the same vapor pressure. The following table is a list of a variety of substances ordered by increasing vapor pressure (in absolute units). Several empirical methods exist to estimate liquid vapor pressure from molecular structure for organic molecules. Some examples are SIMPOL.1 method, the method of Moller et al., and EVAPORATION (Estimation of VApour Pressure of ORganics, Accounting for Temperature, Intramolecular, and Non-additivity effects). In meteorology, the term vapor pressure is used to mean the partial pressure of water vapor in the atmosphere, even if it is not in equilibrium, and the equilibrium vapor pressure is specified otherwise. Meteorologists also use the term saturation vapor pressure to refer to the equilibrium vapor pressure of water or brine above a flat surface, to distinguish it from equilibrium vapor pressure, which takes into account the shape and size of water droplets and particulates in the atmosphere. ^ Růžička, K.; Fulem, M. & Růžička, V. "Vapor Pressure of Organic Compounds. Measurement and Correlation" (PDF). Archived from the original (PDF) on 2010-12-26. Retrieved 2009-10-18. ^ a b Sinnot, R.K. (2005). Chemical Engineering Design] (4th ed.). Butterworth-Heinemann. p. 331. ISBN 978-0-7506-6538-4. ^ Perry, R.H.; Green, D.W., eds. (1997). Perry's Chemical Engineers' Handbook (7th ed.). McGraw-Hill. ISBN 978-0-07-049841-9. ^ Petrucci, Ralph H.; Harwood, William S.; Herring, F.Geoffrey (2002). General Chemistry (8th ed.). Prentice Hall. p. 484. ISBN 978-0-13-014329-7. ^ Dreisbach, R. R. & Spencer, R. S. (1949). "Infinite Points of Cox Chart Families and dt/dP Values at any Pressure". Industrial and Engineering Chemistry. 41 (1). p. 176. doi:10.1021/ie50469a040. ^ a b Moller B.; Rarey J.; Ramjugernath D. (2008). "Estimation of the vapour pressure of non-electrolyte organic compounds via group contributions and group interactions". Journal of Molecular Liquids. 143: 52–63. doi:10.1016/j.molliq.2008.04.020. ^ "Thermophysical Properties Of Fluids II – Methane, Ethane, Propane, Isobutane, And Normal Butane" (page 110 of PDF, page 686 of original document), BA Younglove and JF Ely. ^ "Thermophysical Properties Of Nitrous Oxide" (page 14 of PDF, page 10 of original document), ESDU. ^ Pankow, J. F.; et al. (2008). "SIMPOL.1: a simple group contribution method for predicting vapor pressures and enthalpies of vaporization of multifunctional organic compounds". Atmos. Chem. Phys. 8 (10): 2773–2796. doi:10.5194/acp-8-2773-2008. ^ "Vapour pressure of Pure Liquid Organic Compounds: Estimation by EVAPORATION". Tropospheric Chemistry Modelling at BIRA-IASB. 11 June 2014. Retrieved 2018-11-26. ^ Compernolle, S.; et al. (2011). "EVAPORATION: a new vapour pressure estimation method for organic molecules including non-additivity and intramolecular interactions". Atmos. Chem. Phys. 11 (18): 9431–9450. Bibcode:2011ACP....11.9431C. doi:10.5194/acp-11-9431-2011.